The first EUCROWD public event took place in Ljubljana on 26 October 2016. 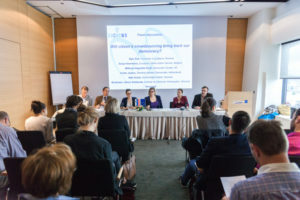 The international conference “How can citizen’s crowdsourcing foster democracy in Europe?” brought together 43 citizens from 10 different countries. Event focused on discussing, sharing experiences and exploring possibilities for creating an on-line platform for citizens crowdsourcing on the future of Europe.